It's a simple yet easily overlooked idea that what we eat takes time, effort and meticulous patience before it reaches our plate. 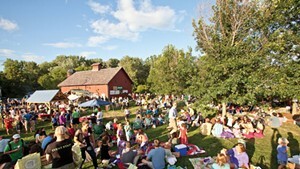 Last week was Open Farm Week in Vermont, a six-day celebration of farms, farmers and everything related. Like a lot of people attempting a locavore lifestyle, I go to farmers markets and buy what is fresh every week. It had been a while since I'd actually gone to the source. Last Thursday, I went to Green Mountain Girls Farm and got up close and very personal with some of our barnyard friends. My friend Anna and I had taken a morning hike at Stowe Pinnacle and, afterward, we kicked around the idea of staying for the Waterbury farmers market. Anna, wanting to put her day off to more adventurous use, stumbled upon something called the Goat Appreciation Package in the Seven Days calendar. Particularly intriguing was a detail that read, "lattes on the hoof," accompanied by a photo of a hand squirting a stream of milk from an udder into a teacup. We let our curiosity lead us half an hour south to a 7-year-old, ultra-diverse hill farm in Northfield. We didn't see any goats upon arrival, but did pass a gorgeous array of vegetables set out for the farm stand that evening. Scanning the compact plot of land, I was impressed by the variety of offerings, from kale and carrots to tomatoes, eggplants and herbs. 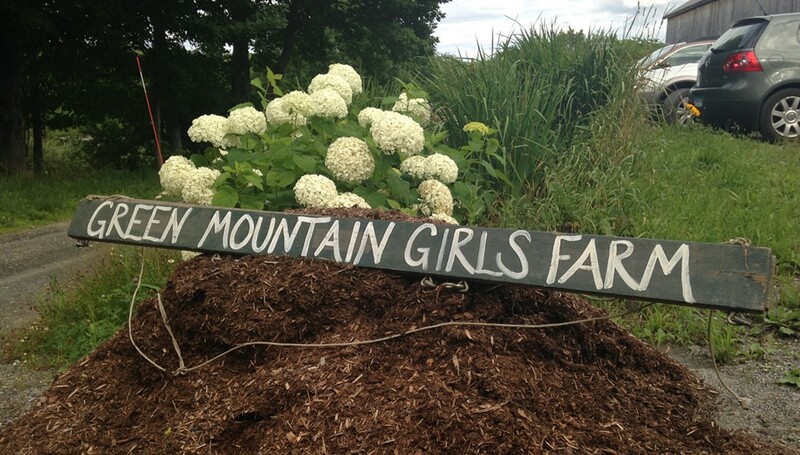 We found Green Mountain Girls co-owner Mari Omland next to a paddock toward the back of the farm. She welcomed us warmly and debriefed us on the four youngest kids — "the future milkers" — who were munching away on lush, knee-high sprawls of vegetation. In goat terms, it was the Garden of Eden. Omland explained that the goats' grazing helps control rampant cover crops, and she considers it "a very important job" on the farm. On our way to meet the milkers (the full-grown does), we had an informal trudge around the farm. Along the way, Omland encouraged us to sample gooseberries, black currants and bright-orange nasturtium flowers. "Hi, girls!" was Omland's greeting to the goats when we reached the larger grazing area. The four grownups were quite the influential bunch, judging from their names: Charlotte (from Charlotte's Web), Anna Perenna (an old Roman deity), Ingrid Bergman and Grace Kelly. 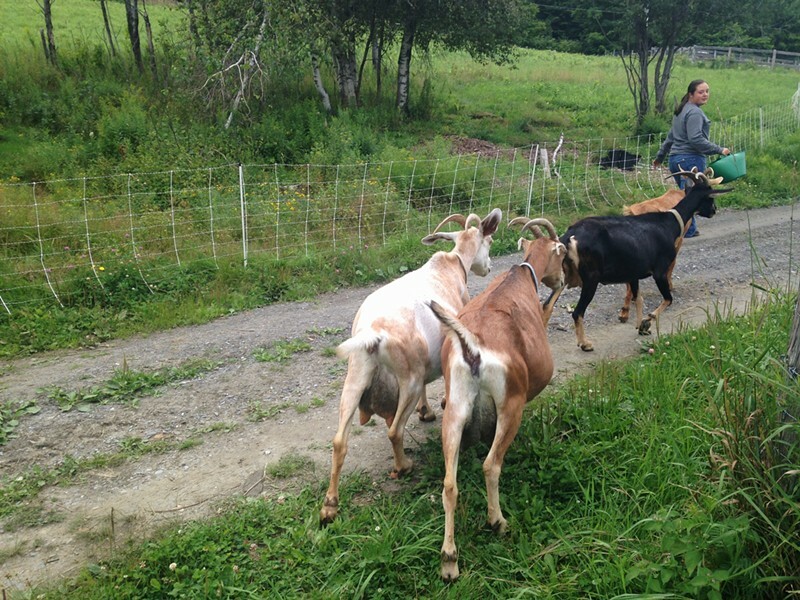 Shaking a basket of irresistible alfalfa pellets, farmhand Annalise Morvan opened the gate and led the girls up toward the milking barn — turned coffee shop for this occasion. It was latte time, and a kettle of decaf coffee (the only thing weak about the visit) was warming up next to some oddly elegant coffee cups. When Omland opened the gate, Ingrid decided she would be our dispenser for the day, and stepped directly onto the milking station all by herself. After cleaning Ingrid's udders, Omland squatted down and asked, "Who's up first?" I can say that the force of the milk stream created considerable foaming and a latte-like color, but the flavor was much milder than your average espresso drink. A stronger cup of coffee with a dash of sweetener would have made it the real deal — but nitpicking isn't really necessary here. 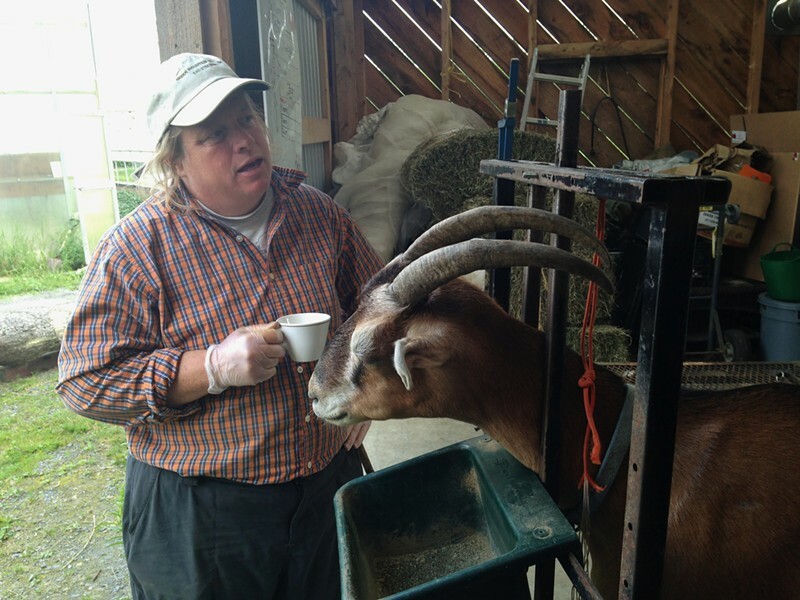 Sipping any sort of coffee next to the animal who just provided you with raw milk is a pretty intimate experience. I imagine that Omland's "on the hoof" barista sessions has caused many eyes to widen as much as mine did. Omland told us that she hopes to engage more of the community by bringing people to the farm this way. "What if every person doing foliage not only stopped for a maple creemee, but they stopped for a latte on the hoof?" Omland asked. "What if agriculture was in the front of people's pictures instead of in the backdrop?" We got a little more gourmet in the farmhouse kitchen, which was polished up for farm stays and special farm-to-table dinners. Goat's-milk-and-honey gelato was on the lesson plan, and it took just three ingredients: eggs from the farm, Brookfield Bee's honey from four miles down the road and, of course, goat's milk from our new friends outside. After demonstrating how to incorporate the ingredients over the stove, Omland sped up the process with a prechilled jar of the gelato mix and an electric ice cream maker. Twenty minutes the later, the eggnog-yellow mixture came out a bit soupy, but the taste blew me away. 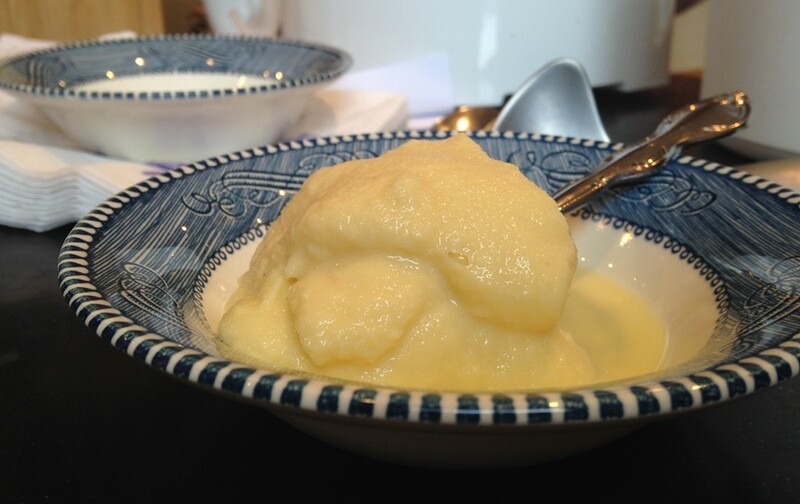 It was intensely rich, sweet and tangy from the honey, but also had the lightness of a custard. Omland was apologetic about the texture, but I assured her I would be fine with drinking a completely liquid version. It might have taken the promise of lattes and fresh gelato, but my appreciation for goats and the farm increased tenfold after this evening. I left with the sense that people should get to know local farms on a level beyond bagged lettuce and bottled milk. So, after the creemee stand and taking all those beautiful landscape photos, people, take a trip to see the goats. It's well worth the visit. You can find the gelato recipe and more about Green Mountain Girls Farm shares, farm stays and events on their (very user-friendly) website: eatstayfarm.com. Seconds of Summer is a weekly blog feature devoted to offbeat seasonal dining experiences.